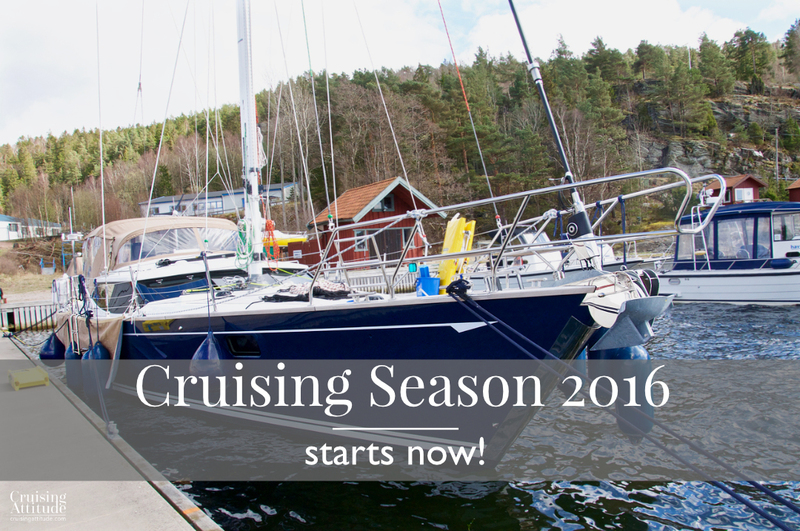 Cruising season 2016 starts now! After a leisurely three-day drive up through Germany, Denmark and the south of Sweden, we are finally back onboard Freja. 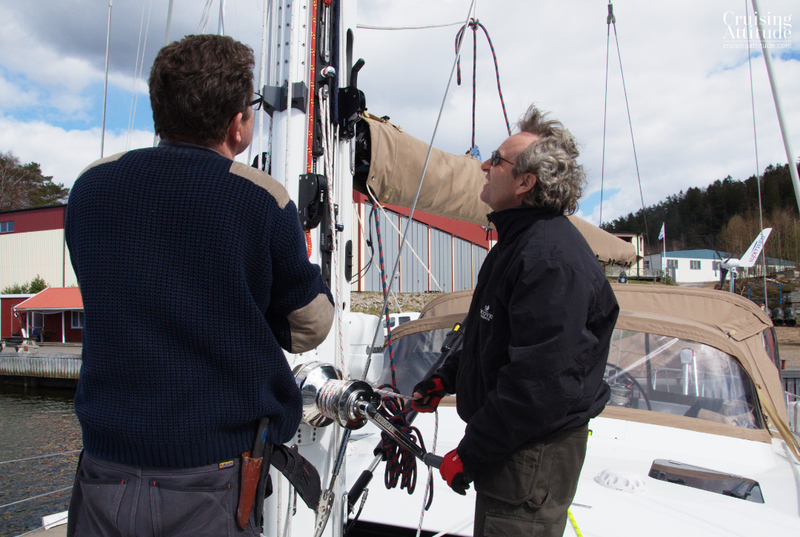 We will be spending the next 10 days or so on mission number one, organising the boat. 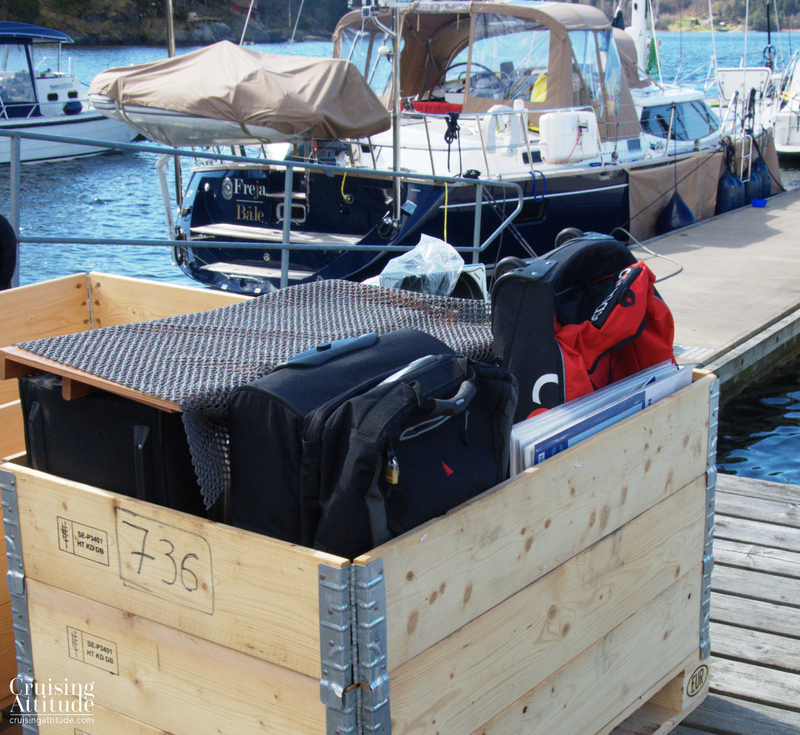 You see, last summer, when we moved most of our things onto the boat, we had only two days to unpack our boxes. All 22 of them. This did not make for a logically organised boat. Nothing was documented, either. So here we are, on the island of Orust in Sweden, going through each drawer, closet, storage hatch and shelf, trying to decided what the most logical place is for everything. 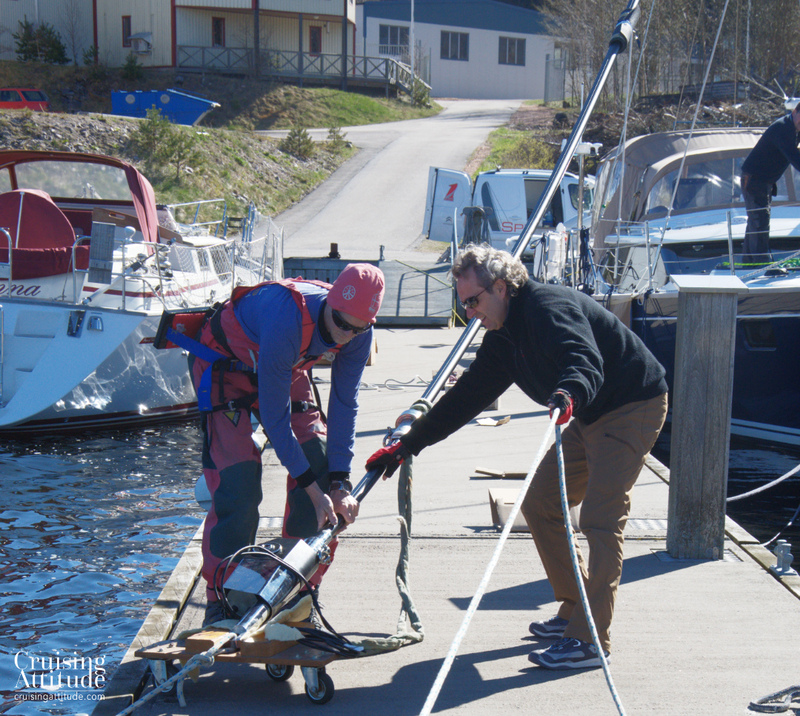 Anodes and other heavy parts and tools go towards the center line and as low in the boat as possible. 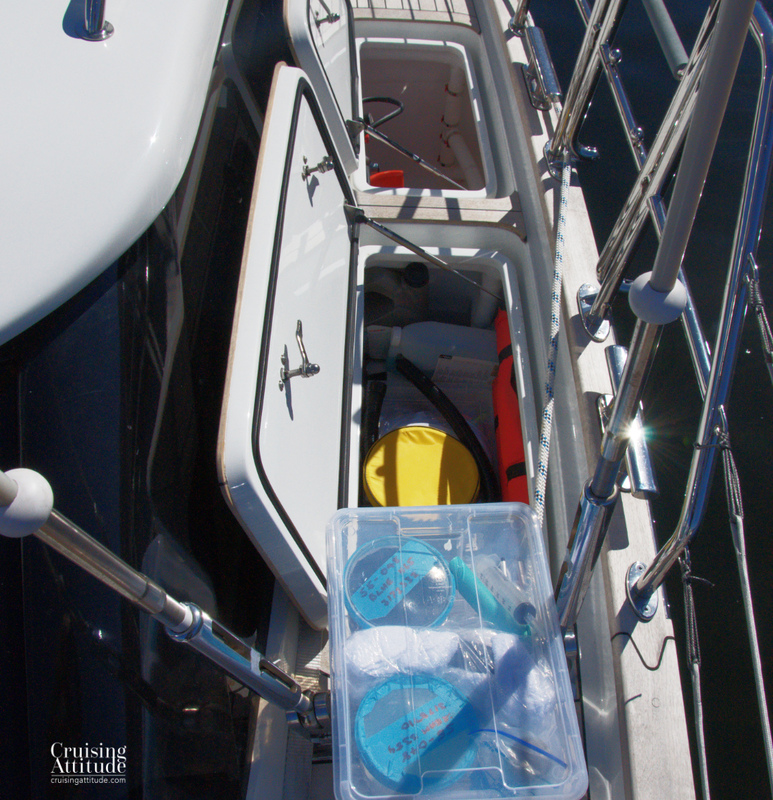 Lighter spares and equipment can go towards the starboard and port sides and higher up. 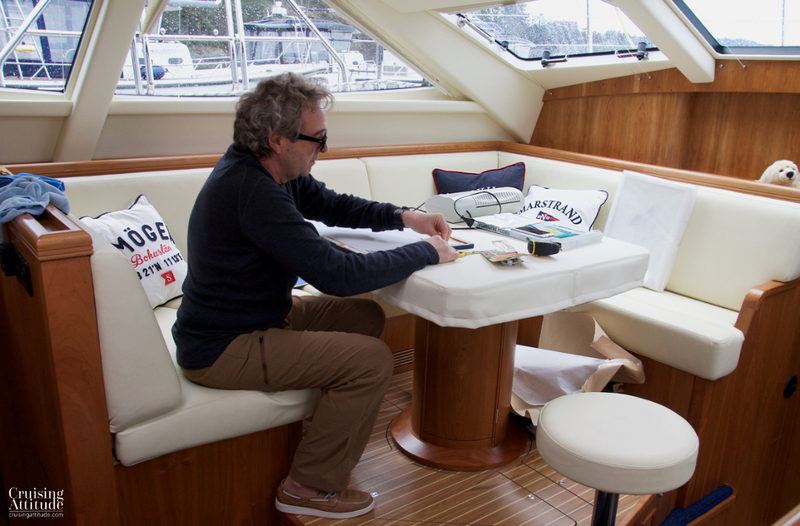 Everything is to be documented, labeled and placed on a boat diagram. 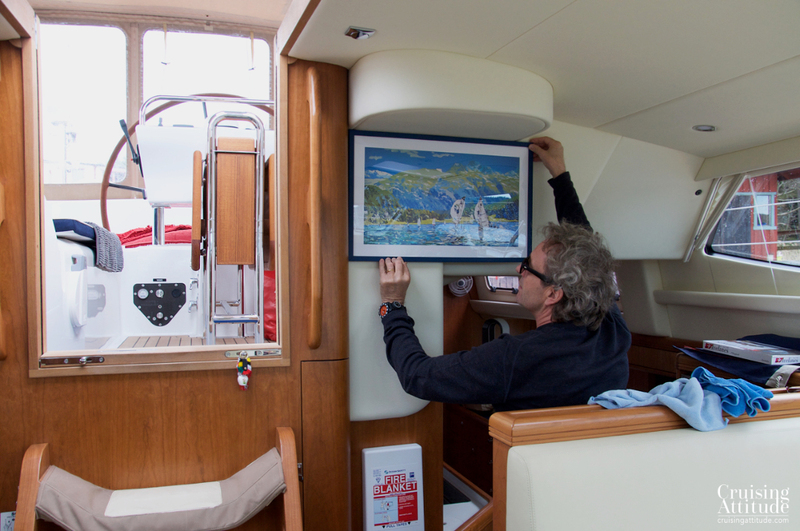 Hanging up a painting of sailing in the Swiss Alps. We started with our clothes. Easy enough as we have only one hanging closet, one large drawer and two large shelves per person. 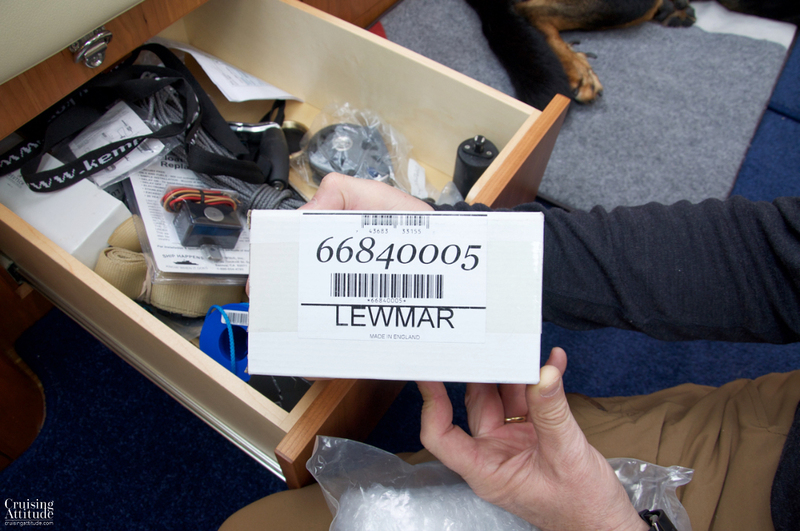 Ok, we are cheating by hanging up our foulies in the workshop hanging locker. Trying to find a place for everything, and then documenting it in a spreadsheet. Then we attacked all of our spare parts, after that, our tools. 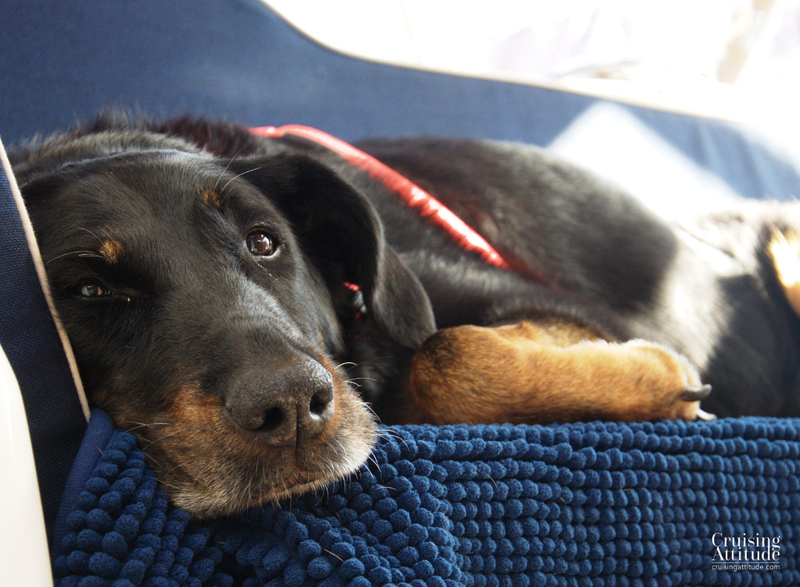 For the past three days, we’ve been organising all of our “stuff” and doing nothing else except walk Senna, our dog. 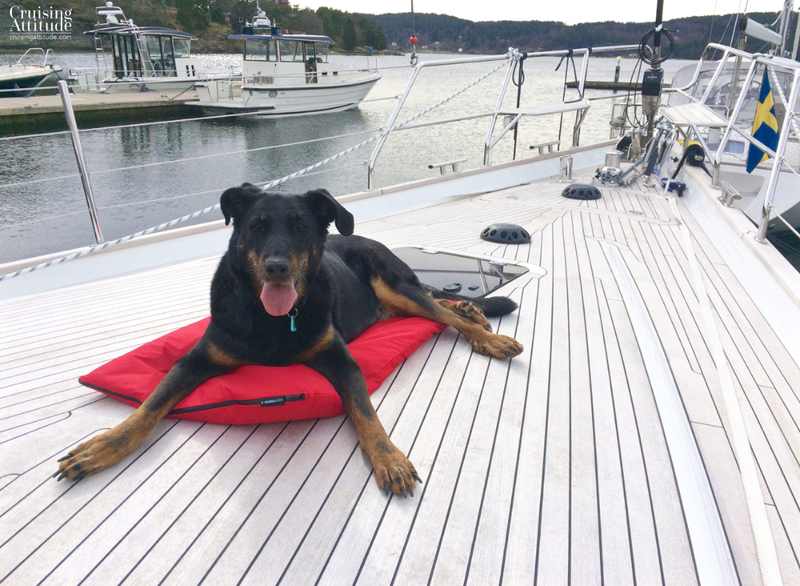 Senna, our dog, finding her place on the boat. 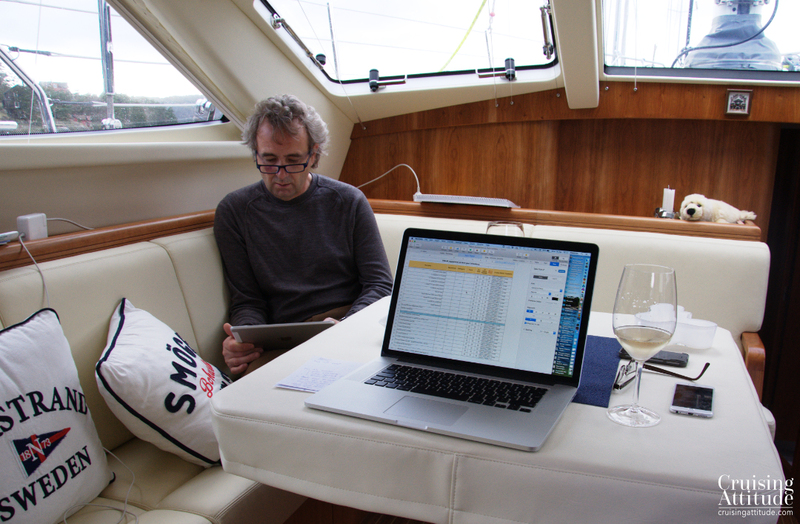 Mission number two is to acclimatise Senna to living on the boat. We are moored alongside the dock at the moment, so getting off and on is reasonably easy. 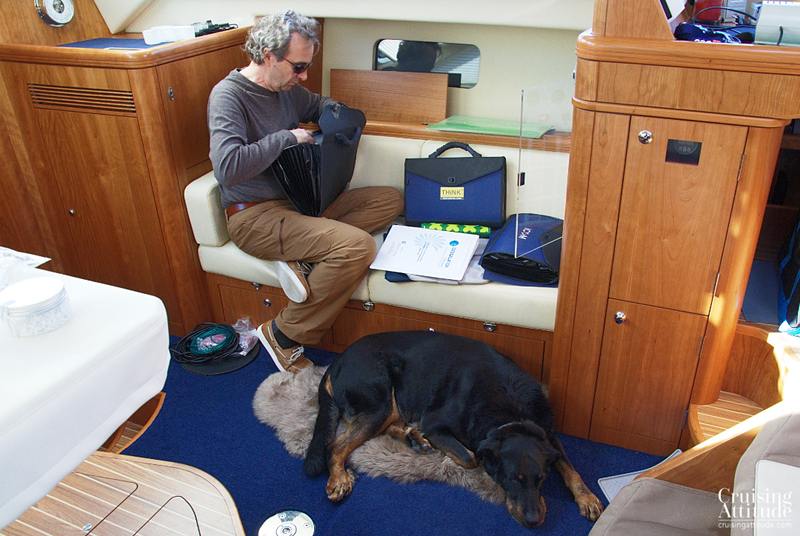 She’s a big dog that weighs around 35 kgs, so we can’t just carry her under one arm to get her onboard. We do have a gangway, but at the moment we are getting by with just placing her two front paws onboard and then lifting her back end onto the deck. 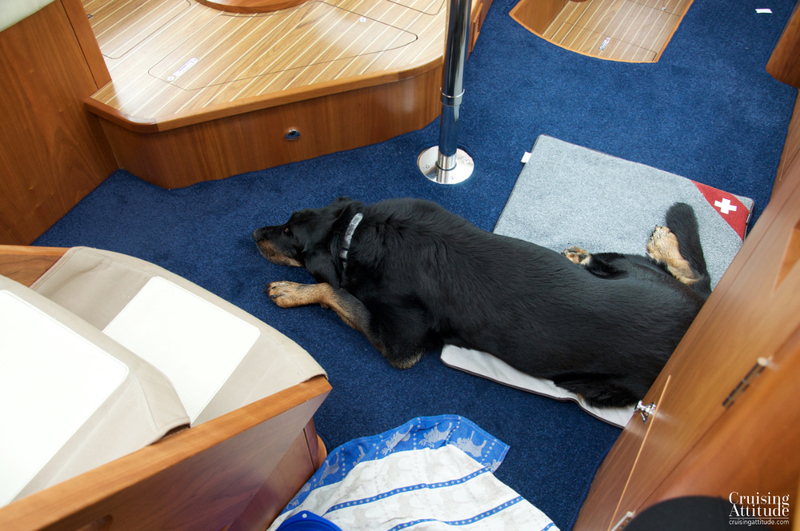 She seems to have no problem with the limited space on the boat. She’s eating her usual dog food, which is a good sign. 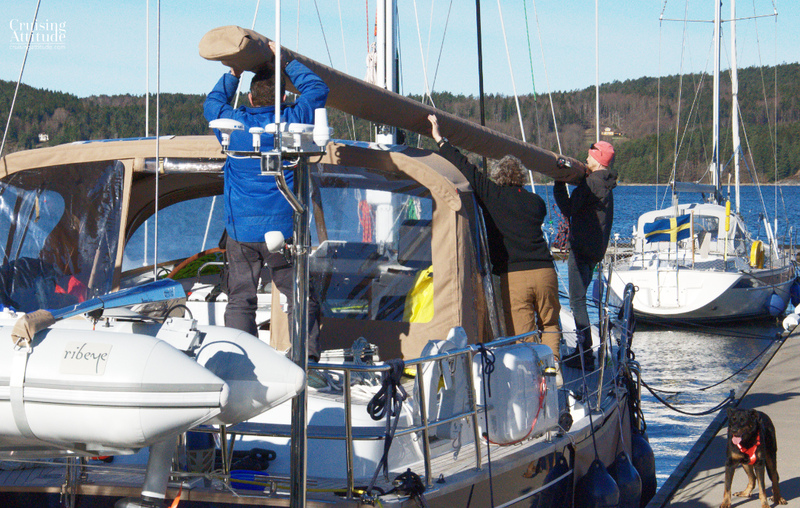 She gets several walks a day around the island of Vindön, but she isn’t keen on swimming yet. Perhaps because the water temperature is only 7°C at the moment. Which brings us to the weather. 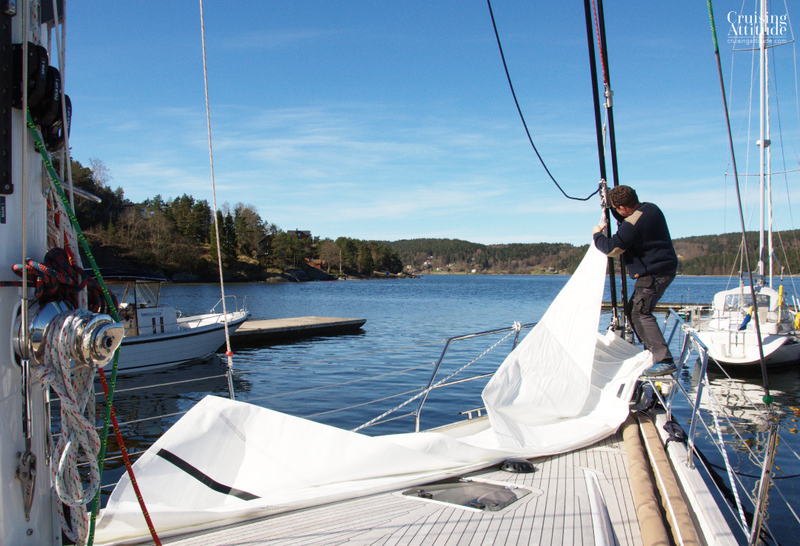 Sweden is not known for having summery weather in early April — a fact than I tried to explain to Jacques. As it’s usually springtime warm in Geneva in April, he couldn’t quite believe me. Well, he does now. Our first 2 days were a “balmy” 13°, but then it started raining. This morning it was only 3° — that’s close to freezing. 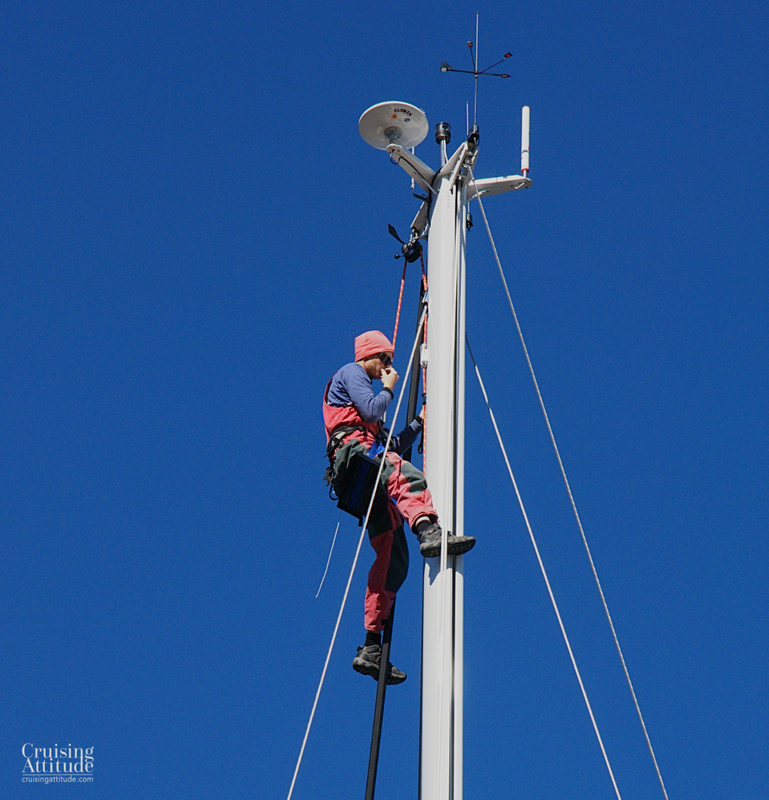 We do have heating on the boat, of course. 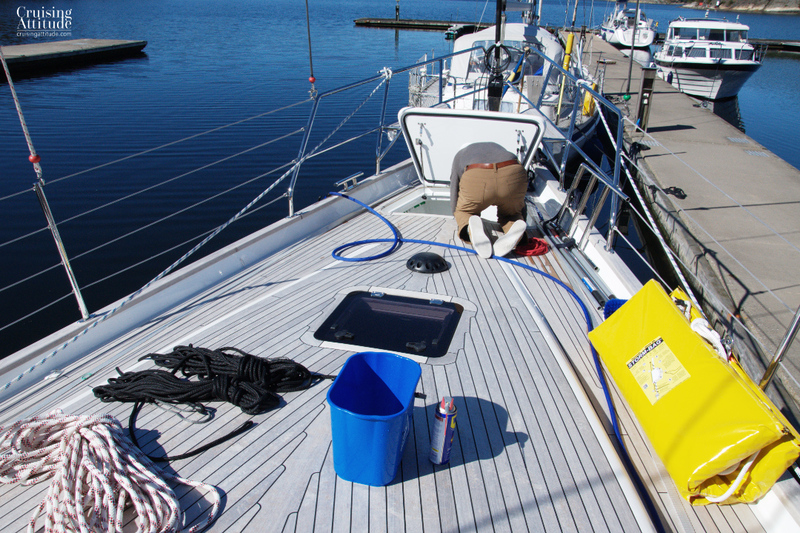 In fact, we have there different ways to heat the boat — the diesel powered Eberspächer marine heater, two Dyson heaters for when we are hooked up to shore power, and the reverse cycle on the air-conditioning system which can heat up to 30°, also for when we are on shore power. So we are at least not going to freeze! We use Command Strips to hang our paintings. They come right off if you decide you don’t want the artwork there anymore.